From a select wheelbarrow collection to a wide horse bucket range, 30+ livery stables near Harrogate, adjacent to Harlow Carr Gardens, means Beaver Horse Shop knows the value of Stable Equipment. From mucking out tools such as manure forks to super yard brush for everyday use, stable tools are great to have around the yard for many different jobs. Come to Beaver Horse Shop in Harrogate to buy some. Grooming is usually easier & less time-consuming when the hair is shortened. A range of Horse Clippers are available from Wahl, Lister & Liveryman. Electric clippers are preferable to scissors as part of the grooming tools to remove or shorten unwanted hair. While quality stable tools make light work of mucking out stables, modern cordless clippers make grooming your horse that much easier. Horse jumps for sale include jump blocks & combi blocks, jump poles & jumping fillers. Beaver Horse Shop Horse Jump List is updated regularly. 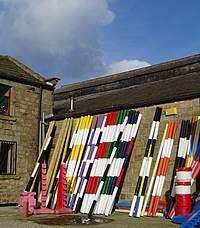 Make horse jumps fun with wooden jumps, hand-painted on the livery stables near Harrogate. Plastic show jumps & plastic jump poles also available. Horse jump cups & horse jump wings in stock for building horse jumps. Visit Beavers, your local Harrogate horse shop for all your stable tools & show jumps.